For Breast Cancer Awareness Month, I would like to give back to Breastcancer.org. The charity’s mission is to help women and their loved ones in “making sense of the complex medical and personal information about breast cancer, so they can make the best decisions for their lives.” Losing a loved one to cancer is tough, so every bit that you can do for a family helps. Come out in support of Breast Cancer Awareness Month with your family and friends and bowl for breast cancer on Saturday Oct. 17, 2015. Bring the flyer with you and bowl anytime between the hours of 9:00 am and 5:00 pm at Woodbridge Bowling Center in Woodbridge, NJ. For everything that you spend at Woodbridge Bowling Center, 15 % of the funds will go to Breastcancer.org. 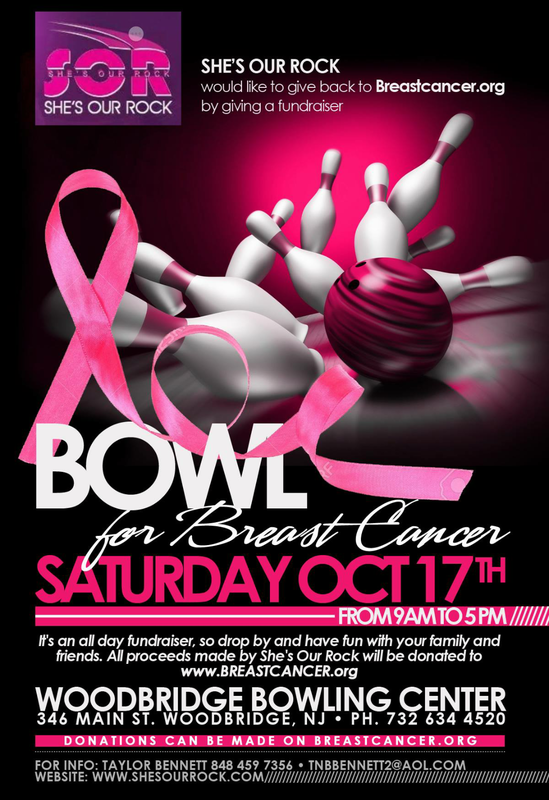 To support the fundraising event, you can also donate to Breastcaner.org on the She’s Our Rock Bowl For Breast Cancer page. Please don’t forget to wear pink! Pingback: S.O.R Boss Women Inc.: New Jersey Women’s Networking Group Looks to Empower Up-and-Coming Entrepreneurs, Artists and Talents – S.O.R Boss Women Inc.